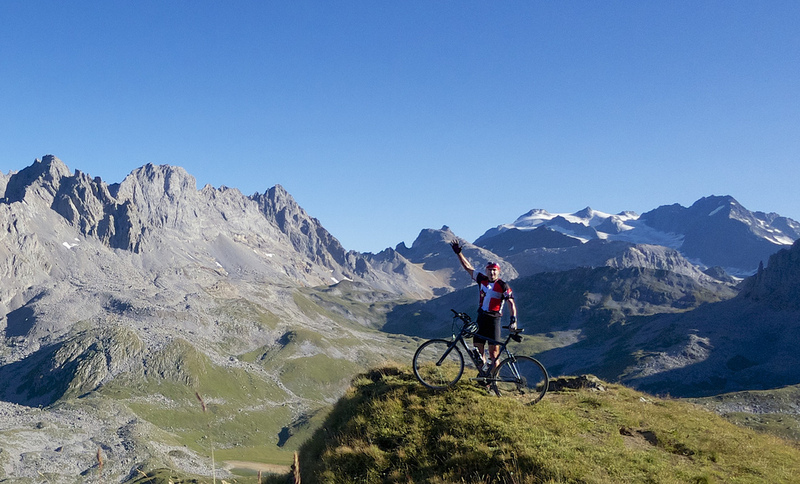 Last weekend we stayed at Courchevel 1650 and explored some challenging and high mountain bike-able cols. 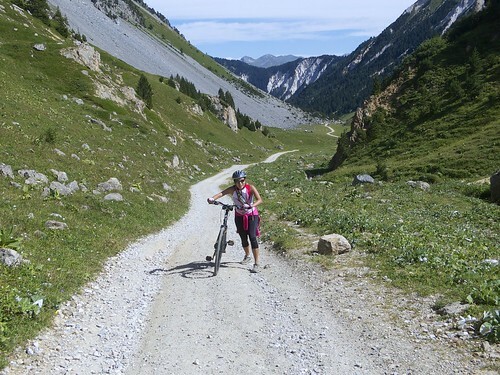 We hiked Saturday, and I was so excited by a certain road that I dashed out on the bike in the late afternoon to follow a well surfaced gravel (and occasionally paved) road to Col de la Platta at 2408 metres. It’s an amazing ride, sometimes very steep, as it winds up the ski slopes. I followed the trail briefly beyond the Col up ontoa high ridge. The views here are fantastic (see top photo), and in fact were motivation for the second part of the mapped ride the next morning – see next photo below. Note: I did the mapped ride in two parts. The route to Col de la Platta while appearing to almost touch the second route, is in fact far, far above it see photo above. 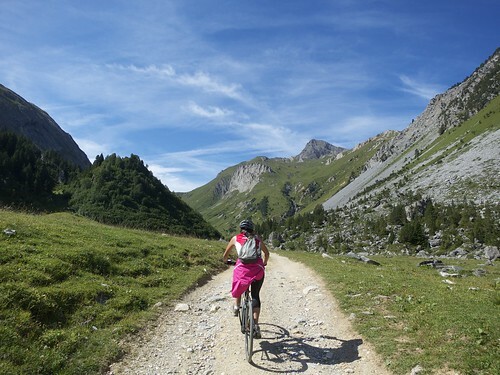 Based on the evening’s scouting from Col de la Platta plus a little map reading, the next morning Doreen and I headed out from Courchevel 1650, to nearby Belvedere and, then onto the non-paved road into the Vallons des Avals. Aval means “lower down.” And this well named valley has high mountains on each side as well as dead-ahead — as it rises into an unpopulated, savage, mountain region. Higher up the road splits. 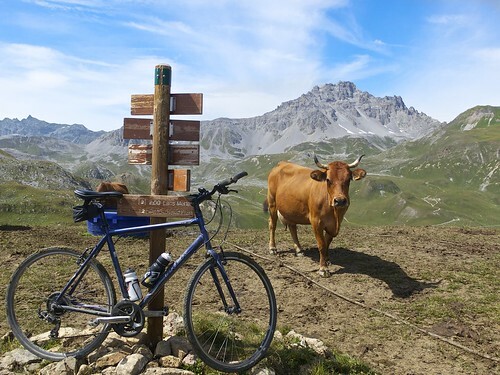 We left Doreen’s bike and she hiked to the Refuge du Grand Plan (2320 metres) for a drink – she’d then hike to Lac Merlet above – I had ended the previous evening’s ride looking down at the Lake. Sowith some pushing, a MtB loop could easily be made here. I descended and met Doreen at the refuge. 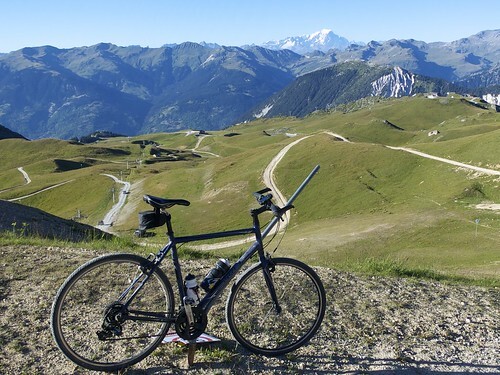 As she headed back to Courchevel, I decided to see if I could cycle to Col de Chanrouge (2531 metres) in the far distance. The Col is over my shoulder in the very top photo. 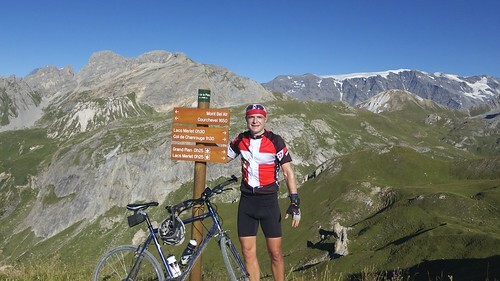 Bottom line, I could ride part of the route (past Lac du Pêtre) and had to push other parts … and finally with roughly a kilometre to go I abandoned the bike (the shame!!) and ran up to the col for a photo. 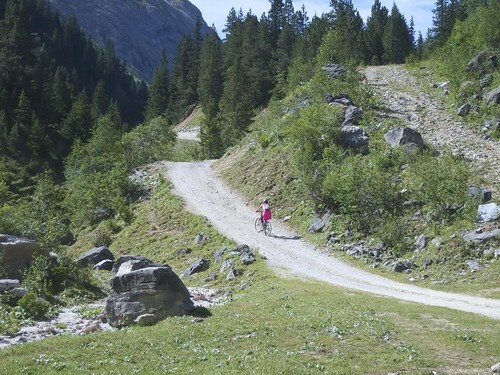 Finally, a thoroughly enjoyable return to Courchevel through the stunning Vallons des Avals. I’ll definitely come back here, perhaps combing these two routes into a challenging loop. 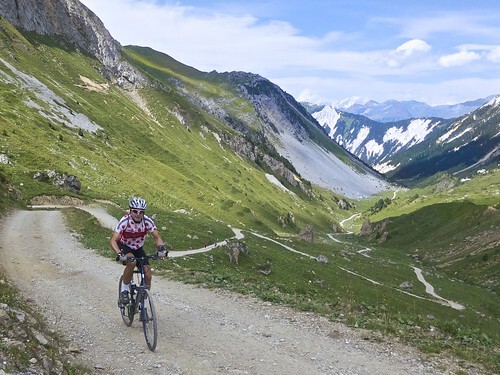 Several very high cols by mountain bike on some pretty cool alpine farm roads. Fabulous.